Discussion in 'iPhone and iPad Games' started by pavelparatov, Jul 2, 2016. Stranded is an adventure game exclusive for iOS. 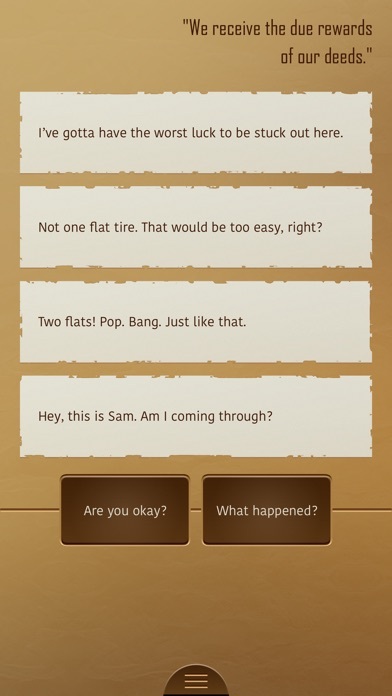 Communicate in real time on your iPhone to guide Sam across the desert, outrun the cops, and make it to the border. Death or freedom: where will your advice lead? Stranded is a branching, interactive story driven by your choices. Follow along as new notifications update you during Sam’s journey, or check in again later to keep playing! Deep in debt to a crime lord and on the run after a heist gone wrong, Sam has no one to turn to for help… except you. • Help Sam survive the desert. • Discover different outcomes based on your choices. • Collect all sixteen achievements. • Replay and explore alternate story paths. • Immersive musical score and illustrations. • Internet connection not required. • No in-app purchases and no ads. • Written by award-winning author Chandler Groover. Stranded is a TrueStory game. 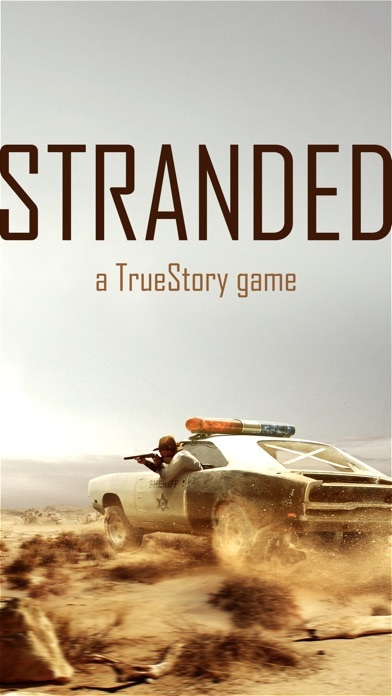 Stranded is TrueStory game written by Chandler Groover, an XYZZY-award-winning interactive fiction author. His work has appeared in sub-Q Magazine and been featured at the Hand Eye Societys WordPlay festival. His mystery game Tobys Nose received both Audience and Alumnis Choice Ribbons for Spring Thing 2015. He writes games to tell stories that expand traditional fictions boundaries. TrueStory is a small software studio inspired by storytelling and focused on building interactive fiction games. Interested. Love me some IF. Waiting for imps. Wow got the game and I've got to say I'm really enjoying this one. Unique situation you have to help with over communication . Fans of lifeline are going to want to jump on this one for sure. I've already become attached to the character and the communication paints a picture perfect for me of the situation. I feel like I'm there with him. Been playing today but if you liked lifeline games then really your going to enjoy this because it's a whole different setting and adventure. This isn't made by the same people but it is that unique genre that hasn't been overdone in my opinion. Hello Jayg2015! Thank you for your thoughts! 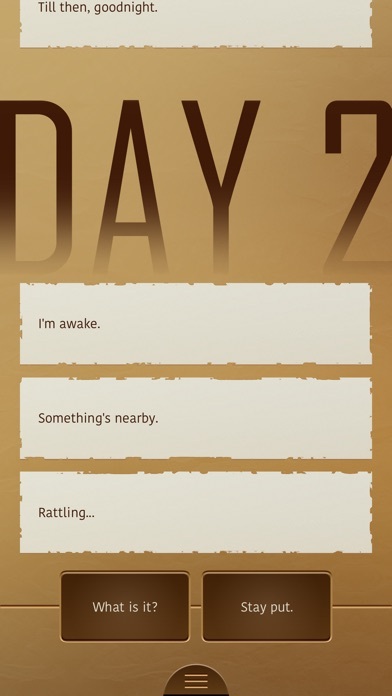 I'd love to know your impressions when you get to the Day 2 ;D And cheers to all Lifeline fans celebrating our passion for interactive fiction. You review is the first one — many thanks from TrueStory team. pavelparatov, I might hit the purchase button soon. Decisions are made and then cool graphics of the event are placed on the screen like the one I'm posting for example. 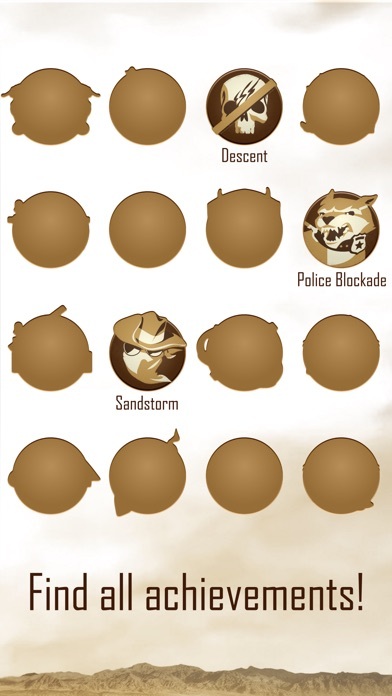 Really fantastic idea for the game. 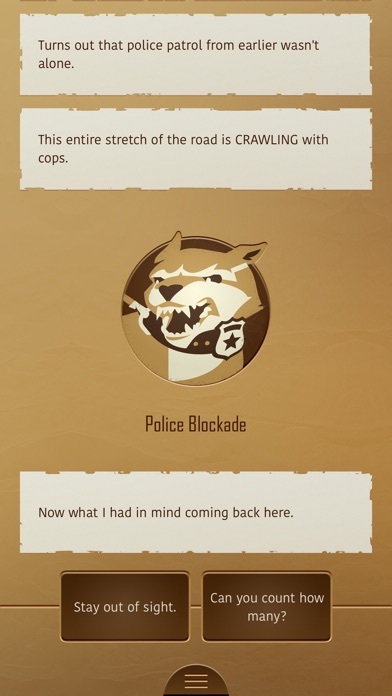 I feel like the bandit is someone I know for how well the story is written. I've bought the game. However, I can't play until next week. I love a dev that gets involved on the forums. It makes the game that much more personal..! Now just to get done with work and hit purchase. Hello Jayg2015, thank you for your idea! We are now thinking of special screen to store all the achievements you've found and hints of what are left. Thank you gquiller! It's a pleasure to talk to players, and we are happy you feel it much more personal! Hey there nicodemus82! Thank you for your message! Can you please tell us what iphone do you have? Some people are still using iOS 8. I think that's what he's referring to. As for a recently developed game, we created a game engine with support of current major iOS version with plans to support it for a long time. So the iOS 9 is the version that we will support even for minority of players after iOS 10 becomes widespread. By the way, iOS 9 works perfect on all devices starting iPhone 4S! Also would be awesome to see an update with achievements like you mentioned. Would add a lot of value. Right! We are planning it in our future update.